Tomorrow, our speaker is the accomplished Denise Ellsworth who is the Program Director of the Honey Bee and Native Pollinator Education Department of Entomology Extension of the Ohio State University based at the OARDC in Wooster, Ohio. Not only will Denise emphasize the role pollinators play in our food production but will explain how to develop a patch work of pollinator friendly plants to help our friends survive and thrive. Especially interesting will be her explanation of how to distinguish those insects that are a member of the wasp and bee families. The Ohio Agricultural Research and Development Center OARDC is a gem that benefits all Ohioans in that its research covers a wide range of agricultural areas that help to improve agricultural methods of food production and advances of the growing of ornamental plants for our gardens including fostering the health of our forests. One such project that we ourselves have great interest is the research performed by Dr. Uttara Samarakoon as it pertains to the use of calcium chloride as far as fungal disease suppression and even eradication on greenhouse flowers and greenhouse grown ornamentals. According to Dr. Samarakoon, her belief is that the calcium supplied in an immediate form is able to “bulk up” the cell walls so that they resist infection of the devastating gray mold called Botrytis cinerea. In addition, she believes that this readily available product is able to destroy the organisms of Botrytis and has seen its power on more than 1000 identified organisms that cause the condition known as powdery mildew that causes the unsightly white coating on the leaves of French lilacs, roses and many flowers. Why the fascination with her research? 1. Calcium chloride that is used as an effective method of disease control is readily available and inexpensive. 2. Gray mold (Botyrtis) has no resistance to calcium chloride. 3. Calcium chloride supplies much needed calcium to plants when applied as a topical spray of between 400 ppm and 1000 ppm of actual calcium. 4. Calcium chloride has an OMRI rating which means it may be used for organic vegetable production. 5. 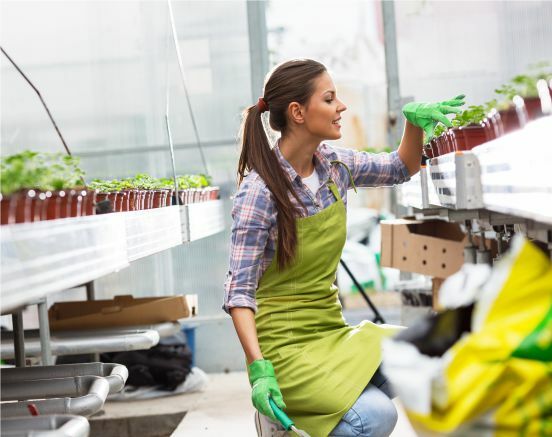 No special protective suits or other equipment are needed when spraying the product and the reentry interval is -0- hours compared with traditional fungicides that require between 4 and 24 hours to elapse before work can begin in the greenhouse. Compared to other fungicides, the cost of the Dow flake product is minuscule. According to Dr. Samarakoon, she observed one strain of the gray mold (Botytis) that was resistant to all fungicides but not to calcium chloride. We will be trialing the calcium chloride “miracle” on many other plants to test for control of certain Phytophthora strains and downy mildew that caused the impatien problems in the last few years. Her research will give us another tool to get rid of chemicals in the greenhouse and nursery just as beneficial insects, mites and nematodes have cut down on our spraying of chemicals. Another interesting research project is Dr. Kubota’s experiments with enhancing the flavor of greenhouse tomatoes by increasing the salt level of the soil through additions of fertilizers or with sodium chloride (table salt). These and many more research projects are in the works and/or ongoing simultaneously. OARDC is an example of what government does for us that we don’t even think about. The motto at the OARDC should be “Better Living Through Research”. Join us tomorrow at 11 a.m. for Denise Ellsworth’s enlightening program of pollinators. Good things come out of OARDC in Wooster.